Rev. Edward Pinkney’s trial starts on Monday, Oct. 27, 8:30 am. Rev. Pinkney speaks to activists in Detroit at a Moratorium NOW Coalition meeting on Oct. 20, 2014. Photo: Leona McElevene. Activists from Detroit will be going to Benton Harbor on Monday, Oct. 27 to stand with Rev. Pinkney as they (the local rulers and Whirlpool Corp.) bring him to trial on phony charges after his successful petition drive to recall the mayor. They admit they have no evidence but count on an all white jury to convict this African American fighter for justice. Yes, that’s right – an all white jury, despite the fact that Benton Harbor is 96% African American. Moratorium Now has chartered a bus to support Rev. Pinkney on the opening day of the trial which starts at 8:30 am in the Berrien County Courthouse. The bus ticket is $20 per person but no one will be turned away for lack of funds. The bus will depart from Lot C in Northland Mall, 21500 Northwestern Hwy, Southfield, just off of J.L. Hudson Drive. Lot C is behind Hudson’s. The Lot C sign is on a pole at the parking lot. Please park all vehicles away from the building. The parking is free and has been authorized by the Head Security of Northland Mall. You can park your vehicle in that area. Bus leaves 5 am SHARP. Please arrive at 4:30 am. The bus will return sometime after 8pm. For more information or to reserve a bus seat, call David Sole at 313-680-5508 or email him at davidsole48@gmail.com. If you leave your name be sure to leave your contact info (on voicemail or email). If you can’t go, please make a donation to Moratorium NOW Coalition, 5920 Second Ave., Detroit, MI 48202, to help someone else who wants to go but can’t afford the fare. St. Joseph, Mich. — Berrien County’s courthouse in St. Joseph, Mich., was filled with people from across the Midwest at a June 5 hearing to determine if a trial judge would pursue yet another case involving the Rev. Edward Pinkney. Despite pleas from defense lawyer Tat Parish, Rev. Pinkney was bound over for trial beginning July 21 for five felony counts of alleged forgery. He has been under house arrest since late April. Rev. Pinkney was on a tether for six weeks and denied access to the Internet as well as transmission of his weekly radio broadcasts. These restrictions were removed at the hearing, allowing Pinkney to travel and engage in his ecumenical and public affairs. Parish says that he will appeal the decision to bind over his client for trial. The proceedings have been placed on a fast track by the judge, who is allowing only six weeks for the defense to prepare. A legal memorandum to presiding Judge Sterling Schrock requested that no charges be filed due to lack of evidence. Rev. Pinkney — a longtime activist in Benton Harbor, Mich. — has opposed the racism within the judicial and political structures in this southwest Michigan town and surrounding county. 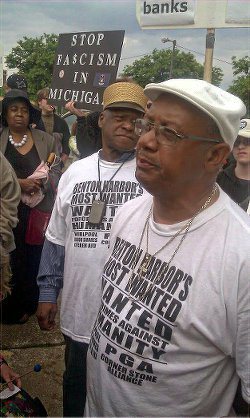 Similar to his persecution in 2007 and 2008 by authorities in Berrien County, prosecutors are saying that the leader of the Black Autonomy Network of Community Organizers group “forged” dates on petitions for a recall election on May 6 against Mayor James Hightower. As a result of the criminal investigation and subsequent charging of Rev. Pinkney, the election to remove Hightower was stayed. In 2007, after Pinkney and others had organized a recall campaign against two city commissioners in Benton Harbor, he was charged with vote tampering, railroaded through the courts, placed under house arrest and later imprisoned for one year for exercising his right to free speech within the media. A national campaign in Rev. Pinkney’s defense during 2008 and 2009 brought about the Michigan Court of Appeals reversal of his three-to-ten-year prison sentence. Since 2010, Rev. Pinkney has been organizing against the wholesale political and economic dictatorship now in place in Benton Harbor and surrounding Berrien County. Throughout Michigan, majority African-American municipalities and now others are under attack from Gov. Rick Snyder and his right-wing cohorts who dominate both the state House and Senate. Many cities, including Detroit, are under emergency management, the fundamental rights of self-rule and due process having been abrogated. Although Benton Harbor is now out from under emergency management, the corporate entities and their representatives in government are firmly in control. Electoral rules in Michigan allow for the recall of public officials if language is approved for a petition that garners sufficient valid signatures. Rev. Pinkney and others have been successful in the recall process over the last few years. Despite these ongoing campaigns, an actual recall election has been subverted by the prosecutors and courts in Berrien County. Supporters of Rev. Pinkney and the BANCO group feel that the carrying out of this prosecution is designed to silence opposition to the blatant racism and class oppression in Berrien County. Delegations from Indiana, New York and other states have come to the area to express solidarity with Pinkney. With travel restrictions lifted, Rev. Pinkney is committed to working for his exoneration in this case. Various organizations have come out in his support and are demanding that the charges be dropped, among them the Detroit-based Moratorium NOW! Coalition and the Michigan Emergency Committee Against War & Injustice. Rev. Pinkney will speak at a joint Moratorium NOW! and MECAWI meeting on Monday, June 23, starting at 7 p.m., at 5920 Second Ave., Detroit.